Welcome to week four of Re-Play! A ten-week series where we go look back in time to visit some of the greatest games of the past, give them an honest review, and see how well they still hold up today! 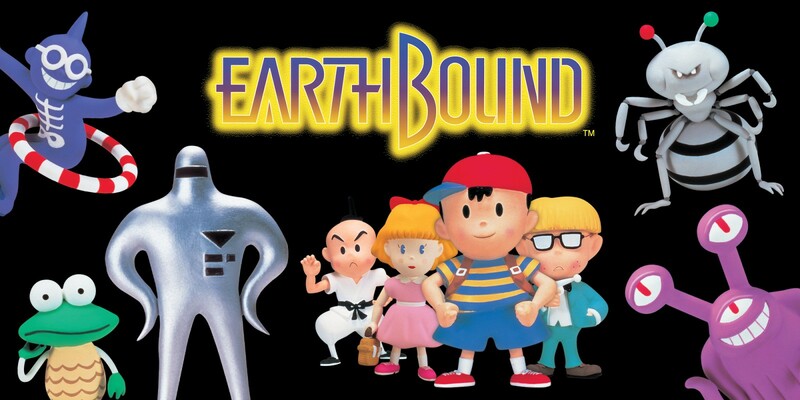 Today we’re journeying to the fictional world of Eagleland to analyze a game which has had a strong cult following for over two decades; Earthbound. Earthbound, or Mother 2 as it is known in Japan, had an interesting development cycle. Mother 1 was never released in the United States, but it was a hit game in Japan in the early 1990’s. Famed Japanese writer Shigesato Itoi wrote the stories for the Mother series, and this led to a very quirky yet charming game. His story was full of unique and unusual elements which Nintendo designers had to figure out for the first time how to accomplish. The producers had also created a massive and beautiful soundtrack that the game designers struggled with fitting on the cartridge. This litany of issues led to the developers asking the then head of Hal Laboratories and future president of Nintendo, Satoru Iwata for help. Known at the time to be an expert coder, he basically wrote the code for the entire game and helped physicalize Itoi’s vision into this beautiful game. In 1995, an English-localization team worked with Itoi to translate as much goofy humor and absurdity into the story as possible for English audiences, and that quirkiness still rings true today. And trust me, Earthbound has quirkiness in spades. The game begins with the protagonist Ness waking up in the middle of the night to a loud crash outside his house. Along with his neighbor and his dog, Ness investigates to find that a meteorite crashed nearby. However, it turns out that the meteorite was actually a portal from the future which allowed a highly-advanced bee-like being known as Buzz-Buzz to travel to this time. Buzz-Buzz then recruits Ness to fight in a battle to save the future from an evil being known as Giygas. Thus Ness is thrust into an adventure to recruit friends and travel the world to prevent the end of the world. And what a fantastical world Earthbound holds. Ness and friends travel through small towns, bustling cities, deserts, the Arctic, jungles, to a pre-historic land and even through time to accomplish their goals. Every area of this game just oozes charm and diversity, and the characters the player meets along the way just add to the wonderful atmosphere. There are plenty of memorable side-characters from the inventor known as Apple-Kid to befriending the game’s equivalent of the Loch-Ness monster. Earthbound also manages to stay decently grounded in reality, as many locations and characters are parallels to real-world places or people. The game is constantly just familiar enough to feel like you know this world, while at the same time managing to be something absurd. I mean, what other game do you fight a possessed circus tent or a sentient pile of vomit? While most role-playing games have you fighting mythical creatures throughout the story, Earthbound bucks the trend by having some of the most unusual enemies and combat in the genre. Most of the “monsters” in the game are people or animals, and you will find yourself fighting hippies and skateboarders within the first few hours. The oddness extends to the boss battles as well, as the first boss in the game is just a giant ant. Battles are also not random, as you can see the enemies approach you on the world map unless you are stronger than them to which the enemies actively run away from you. The combat in the game also has some unique twists. The battles are run through a turn-based battle system as most RPG’s of the era are, however only the enemies, the varying psychedelic backgrounds, and some attacks are visible to the player. Once a player is damaged in battle, their health slowly drops on the screen, and a character is not “knocked out” of the fight until that gauge reaches zero. This added an extra element of strategy to the fights, as if the player acts quickly enough, the damaged character can attack again or be healed before they are actually knocked out. Also if the enemy is killed before their health meter reaches zero, their life will be saved as well. With the uniqueness of the various enemies and the unusual way the battles in this game play out, combat rarely feels stale. However Earthbound does have a minor pacing problem when it comes to battles getting too hard, too quickly. The few times this happens in the game, the player should “grind” to make the game more manageable, to which I am grateful that the combat is fun and entertaining even though battles are mostly static, with little to no animation most of the time. However, this works to Earthbound’s benefit, as these fights are framed by the aforementioned psychedelic backgrounds, and some amazing battle music to boot. The music in Earthbound is absolutely glorious. With 170 different music tracks in this game, you almost never hear the same songs twice (outside of battle of course). This soundtrack works in tandem with the gorgeous setpieces throughout the game, perfectly setting the tone and or mood for whatever the scenario is. This kind of musical arrangement for a game was rarely seen at this point in video game history. The music is the final piece in what helps make this game so unique. Earthbound is nothing if not unique. The quirky gameplay and story, combined with such a stylized presentation work together to create something so unique that there hasn’t been anything quite like it since. This is not a traditional RPG and sometimes feels like you’re playing a weird and goofy sci-fi novel, though that isn’t a bad thing. This story of friendship and adventure just oozes charm, and it keeps you sucked in from start to finish. If you haven’t treated yourself to playing through Earthbound yet, you should. Even if you played it once in your childhood, this game demands a revisit as the charm and humor are appreciated differently when playing this game as an adult. Trust me when I say that you should play this game, and see why people have been raving about it for 23 years.